When you walk onto the Saint Mary’s University campus from the nearest bus stop, what you find at first is a no-smoking sign written in Chinese. On the campus, there are signs in English and Arabic too. But one student doesn’t feel comfortable with it. Xiang Li is a King’s student in the one – year bachelor of journalism program. He is from China, and felt strange when he visited SMU and found the Chinese notice. “If the sign is made in specific languages, no matter in which languages, it gives out a stereotyped opinion about those specific group,” he says. A SMU spokesman, however, says the signs are posted for a reason. “The languages represented on the banners are aligned with our largest student populations,” Travis Smith said. Tieming Wang, an undergraduate business student at SMU, thinks the signs are helpful. “When I came to this college two years ago, I wasn’t good at English. 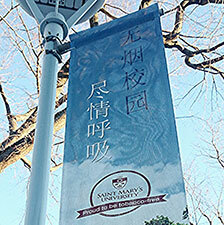 Then I found the Chinese sign and in a moment I could understand we couldn’t smoke at SMU,” Wang says. Smith emphasizes the meaning of the international notice especially in Chinese due to the ratio of international students at SMU. He also says using different languages is just one way in which the banners communicate with students. Xiang Li, however, thinks there can be banners in other languages. I think it’s fair. I don’t have the last 2 school year’s numbers. But from 2008-2012 we saw a 74.8% increase in the Chinese student population to, as the article stated, just under 1000 students (923 as of 2012). To be honest, from my very non-rigorous observations, a disproportionate amount of the smokers on campus are of Chinese descent – for whatever reason that may be. If one or two signs are written in Chinese and the net result is less secondhand smoke on campus – I think it’s definitely necessary.